Question: Kindly help me in workstation layout. How to prepare a good workstation layout in small area with 45 m/c, 14 UBT and 4 DN and remaining SN m/c to make a shirt? Prior to doing line layout of a product, design workstation layout for each individual workstations of the line. You may be looking for line layout (machine layout) for shirt manufacturing. Please note, which machines are required and how many required depend on the operations. First, make operation breakdown and according to operations assign machines. Refer to article operation breakdown for formal shirt. In your machine list Feed of Arm (FOA) machine is missing. Also you have has not listed buttoning machines. So, I guess you will do buttoning and buttonholing job in another area (most probably in finishing). In the following, I have given a listed characteristic of good workstation layout and calculation of space required for a line with 45 machines. The design of the workstation layout widely vary from one operation to another depending on the size of work, a number of components to be worked on and type of machine to handle during operation. However few things are common for each workstation those are listed below. All works (components) should be placed as closer as possible to the operator for easy reach. Nothing should stuck operators during picking up and disposing components. Keep bins or other means to dispose finished work. 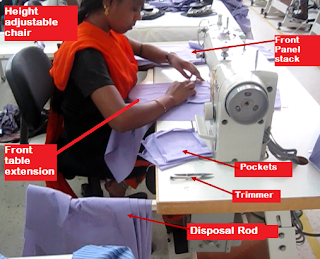 Operators must have enough space on the table to handle the garment parts. If required add table extension near operator and left side of the machine. Enough space in between two machine for operator movement. Use jig and folders where required. If you provide trimmer (for thread cutting) to operator define a space for it. Example of a good workstation layout has been shown in the following image. Workstation: Attaching front chest pocket. I am not completely clear what do you mean by ‘small area’. How much area required will depend on number of total workstations in the line. As per common sewing workstation space 3.5 X 3.5 square feet is needed per machine. Considering sewing line is made of two rows of machine, centre table (2 feet wide) and walking space (2X4 feet) both sides of the line. More than these you need to place check point at the end of each section with small table (3X4 feet) and space for manual work – such as marking and pressing. Marking and pressing job can be done outside of the line but still you need space for that. If you like to add tables for manual work and checking garment components add their space to calculate total length of the line. Finally calculate total area for your shirt line multiplying length by line width, i.e. 13X80.5 squire feet. Designing a good sewing workstation and layout.